When it comes to winter, you need to think practical – there’s no two ways about it. It’s all well and good getting suited and booted every single morning in your best wool three-piece, but when it’s barely reaching 3 degrees Celsius, you’ll look more dumb a** than dandy. This season, lose all finishing touches, elegant accents and finely-tuned accessories – channel your inner hunter gatherer. Whether you spend your afternoons toiling in the field (unlikely) or typing away in a well-heated, fairly comfortable office (sounds more like it), bring your style back to the barest of basics. We’re not recommending you forage for your dinner every evening or club your girlfriend on the way back to the cave, but it’s all about finding your inner alpha male. Yes, there is a rugged, rough-hewn, uber masculine farmhand in there somewhere. It might take a while to find (I’m still searching, with my narrow shoulders, spindly frame and slow reaction times) but at least you can dress with a bit of bravado. It’s high time to strip back the embellishment and embrace the utmost in simplicity… and it’s more straight forward than you think. We’ve said it once and we’ll say it again: good layering maketh the outfit (and in turn, maketh the hunter gatherer). By combining texture, pattern and print we can craft an outfit that is both memorable and protective. Looking cool doesn’t mean you should forfeit insulation, after all. 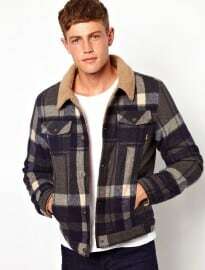 In the case of the classic hunter gatherer look, team simple jackets and shirts with classic tees, thick flannels and denim shirts – or anything that vaguely looks as if it belongs in Kansas, 1948. Practise layering within your everyday looks; multiple pieces and fabrics will help develop outfits that have a real sense of depth and are completely unique. A strong blend of garments is almost always the jumping off point when constructing classic blue collar style – but what do we throw into the mix? The staple of hunter gatherers the world over, the humble check has defined generation after generation of miners, fisherman and woodcutters. It has remained a timeless classic for good reason. Whether in shirt, coat or shirt-jacket form, no outdoors look can go without. However, there’s more to the classic check than most would think, and it pains me to see hordes of men blindly selecting ill-fitting, poorly coloured pieces. Size wise, think complementary. The whole point of style is to accentuate our outward appearance, and even though the underlying ethos is centred on comfort and practicality, this look is no different. Medium frames should opt for a slightly relaxed or oversized fit to really convey a sense of effortlessness – trying too hard is the antithesis of the hunter gatherer. On the other hand, smaller and larger physiques should look for semi-fitted styles, which will complement their frame better by keeping the overall silhouette in proportion. Colour should also play a big part in your decision and, believe it or not, skin tone is something us gents should be fully aware of. 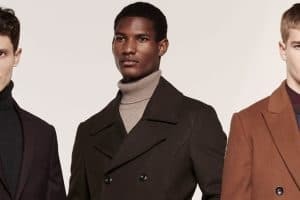 Paler folk should avoid blocks of cream and beige at all costs – you’ll look pale enough this winter, and such colours will only wash out your complexion further. Think rich or warmer hues – burgundy, emerald green and orange are all great on trend choices – and you’ll avoid vampire territory with ease. The more swarthy of our kind can breathe a sigh of relief – richer skin colours can usually hold most colours. 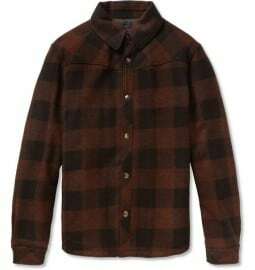 In terms of material, brushed cotton and flannel are soft, warm and ooze the casual, effortless appeal you’re after. Although the checked shirt has become a modern wardrobe staple and a ubiquitous part of the everyday male’s attire, there are ways you can separate your look from the crowd this year. Stay along the workwear track and you’ll find a top over-layer that complements the overall aesthetic. Donkey jackets, worker coats and classic parkas are all more than applicable and can be found in a variety of colours this season. Medium tones and hues are ideal: too bright (no fluoro, not now and not ever) and you run the risk of cheapening the look, too dark and there’s nothing at all memorable. Just remember to keep things simple. Modern trends or gimmicky accents jar and throw your outfit into the present – and not in a good way – so always stick to traditional cuts and high-end craftsmanship. The fur/borg collar is currently trending, and could be just the detailing you need in order to make your jacket stand out in an authentic way. 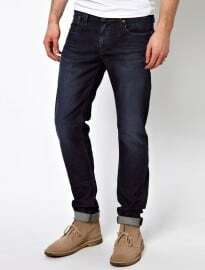 As a foolproof solution, look no further than slim-leg denim. 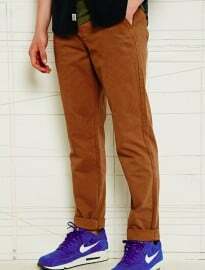 If you’re trekking the denim route, avoid colours that coordinate too closely to your upper body. 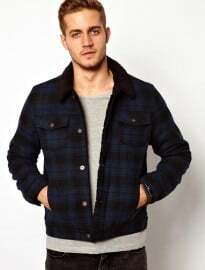 Light navy checks and matching jeans are more redneck than hunter gatherer, and nobody wants to look like Cotton Eyed Joe – if you do, close your browser immediately because we’ll never get on. 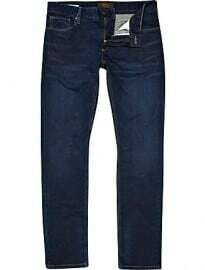 Darker coloured jeans complement most physiques and offer that classic ‘blue jean’ worker look; let’s not forget than denim overalls were originally conceived for the industrial classes of the American South/Midwest. When it comes to footwear, we have one saviour, one rare stag to quell all our sartorial questions: Dr. Martens. Durable, comfortable and always on point, these hard-wearing boots embody the hardened hunter gatherer on his way back from the field. Cherry red, black or navy are all solid choices that avoid the Dalstonite feel of patent leather and over-embellishment. With quality, however, comes a price tag. They’re not the cheapest of brands and as such, traditional desert boots or other heritage-infused styles offer suitable alternatives. Once again, simplicity and practicality should be the focus. Sneakers and trainers are a little too youthful and whilst often fun, dilute the hunter gatherer look with juvenile practice. When it comes to menswear, we’ve seen a real shift in experimentalism. Lines have been blurred, shapes distorted and silhouettes manipulated as the industry makes creative progress. This can only be applauded. That being said, there’s nothing wrong with keeping your look classic and the hunter gatherer allows us to go back to basics: the man as provider, the man as hunter, the man as a man in all his weather-worn glory. You don’t have to be the rugged alpha male, but taking inspiration this winter is a very strong move indeed.